While most people are still getting to grips with 12Mp cameraphones, Toshiba has announced it will produce a 15Mp CMOS sensor for cameras and handsets next year. The sensor – which technically delivers 14.6Mp – measures 1/2.3in and is based on “backside illumination technology” (BSI). 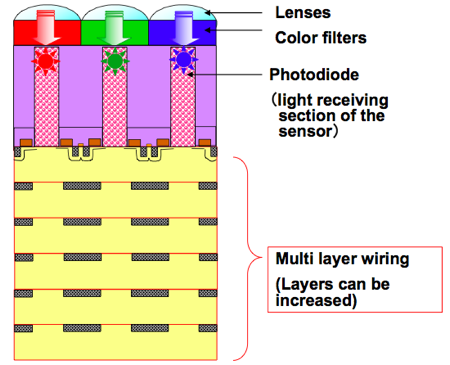 Toshiba explained that BSI technology (above) moves the sensor's light-detecting photodiodes right up against the lenses and light filters. That puts them ahead of the transistor and associated wiring which amplify the signal from the photodiode. 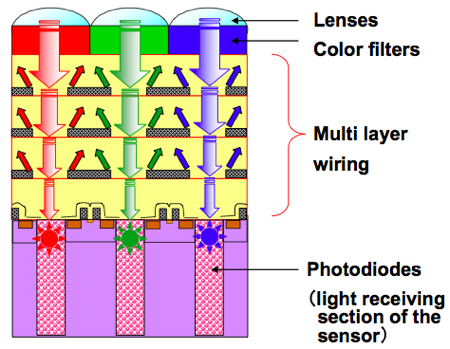 Older CMOS sensor designs (below) placed the photodiode behind the wiring, which scattered some the of the incident light, in turn reducing the amount entering the photodiode and thus the sensor's overall light sensitivity. Toshiba said BSI increases light sensitivity and absorption at the photodiode by 40 per cent. The technology also makes for finer image pixels, Toshiba added.